There are various iPhone remotes for TiVo that let you control your DVR to a limited extent, but the TiVo iPad Remote is basically the TiVo UI, laid out in front of you at all times. 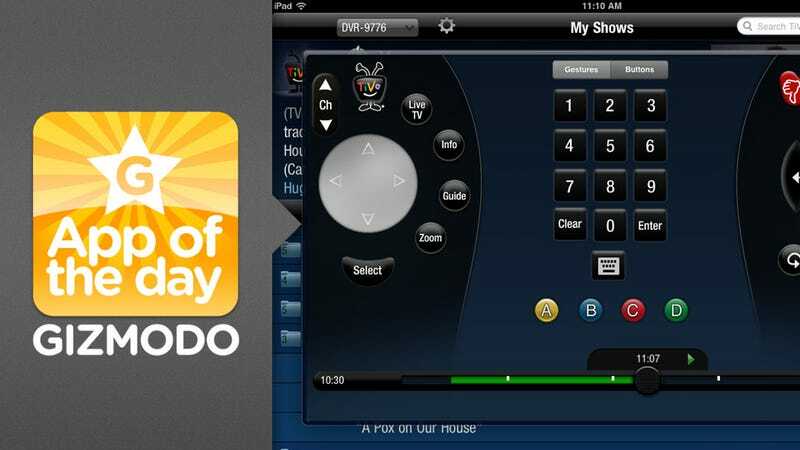 TiVo's official remote app for the iPad. It has five "tabs", and lets you manage your recordings, find new shows to watch, look through the TV guide, and basically browse through your TiVo interface as if you're actually browsing through the interface. It's independent of what's going on on the TV, so you can be watching a show and be doing all this simultaneously. The Venn Diagram intersection of iPad owners, TiVo owners, and TV watchers that aren't uncomfortable with holding something in their lap while they enjoy their televisions. There's no real alternative, other than simple TiVo remotes, so this is the best solution to controlling and managing your TiVo. Simple things like being able to rate shows in your DVR queue, or being able to mass-delete shows would be phenomenal. As is, it's the best remote for your TiVo.